Our rhubarb stalks are plump and ready for picking. 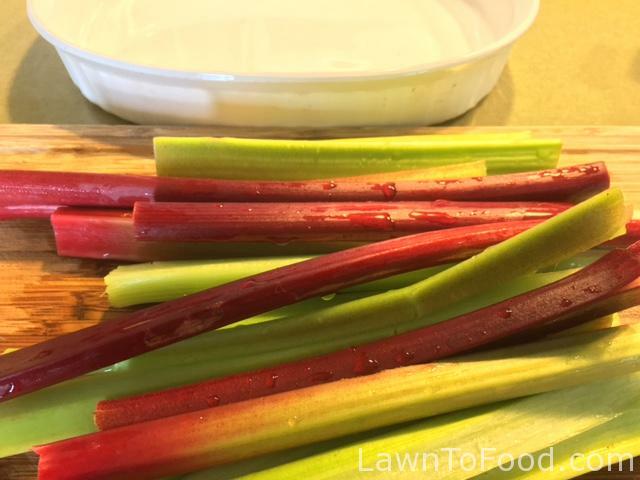 Over the next 8 to 10 weeks I’ll harvest the fattest and longest stalks to make Rhubarb Crumble and other flavourful recipes. Rhubarb is a perennial plant that belongs to the vegetable family but is most often used in fruity desserts. The plants are easy to grow, preferring rich soil, full sun and good drainage. 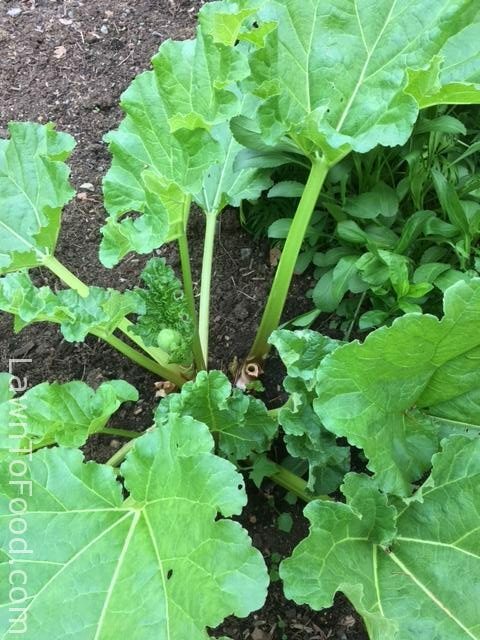 New Rhubarb plants are divided off from exhisiting crowns. Make sure that you like the colour, and characteristics, of the original plant before planting that variety in your garden. I’ve ended up with two distinctly different rhubarb varieties in our yard. One has the typical rich red stalks and the other has extra large green stalks. I would have replaced the green-stalked Rhubarb with a prettier red variety, except for the fact that it tastes delicious. The green rhubarb stalks are tart with really intense rhubarb flavour. To make my Rhubarb Crumble recipe, wash and trim 8 to 10 stalks of rhubarb. Butter a couple of baking dishes to prevent sticking. 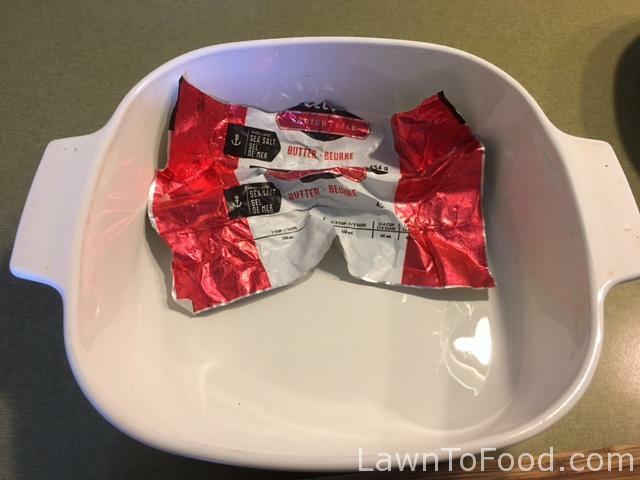 I use half of a butter wrapper to spread a thin film of butter around the dishes. I save all my butter wrappers, folded up in the fridge, for this very purpose. To make the crumble topping, use even amounts of flour, sugar, oatmeal and butter. To cover these two baking dishes with crumble, I used 1 cup of flour, 1 cup sugar, 1 cup oatmeal and 1 cup butter with 1 tsp. baking soda. 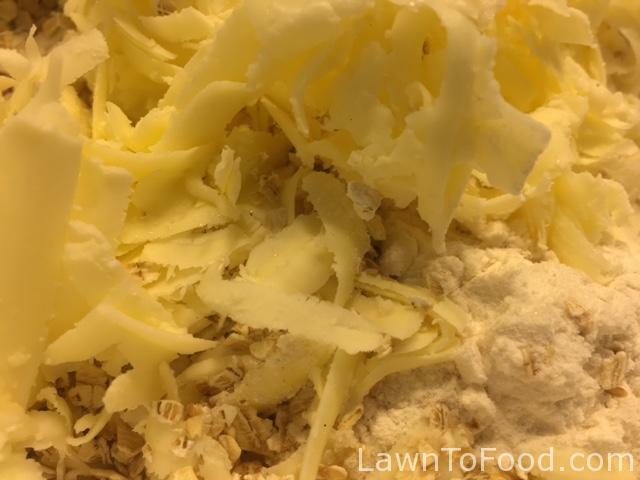 If the butter is hard, grating it with a cheese grater into the flour mixture, helps to get it incorporated quickly. I use my hands to rub the ingredients together until they are evenly dispersed. 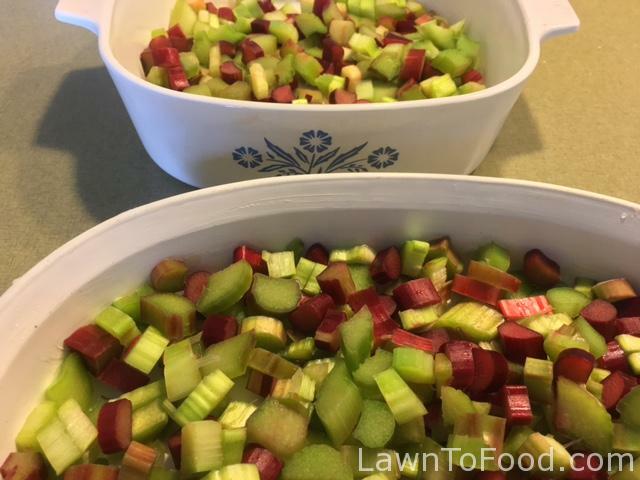 Since the topping will be sweet and buttery, I do not add any ingredients to the chopped rhubarb. 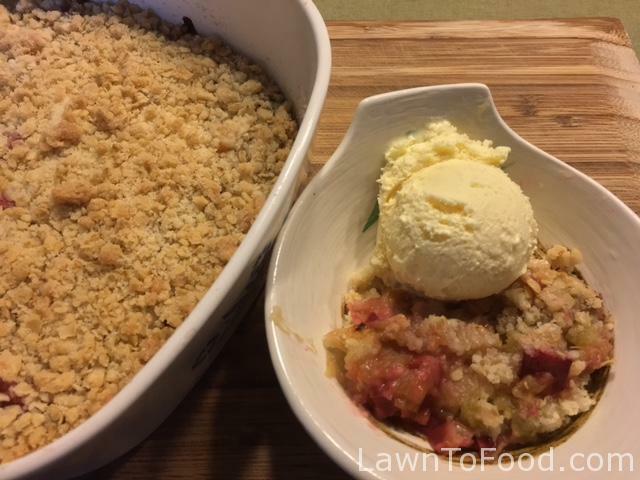 Parts of the crumble topping will melt down into the rhubarb juices as it bakes in the oven. Portion half of the crumble mixture on to each baking dish and then bake at 350F for 20-25 minutes. 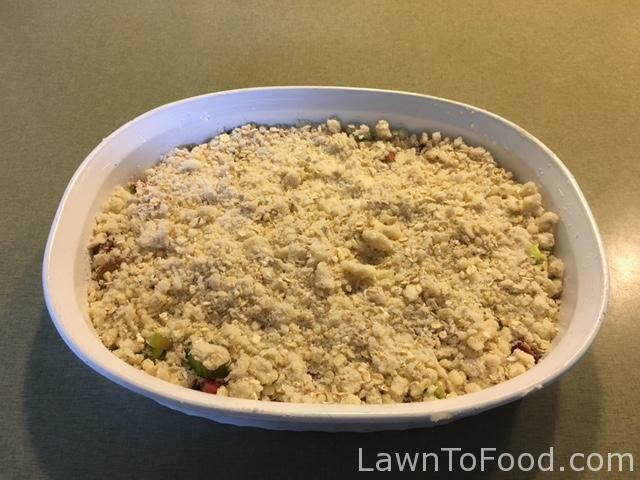 At this stage, with raw rhubarb and unbaked crumble topping, the whole baking dish can be covered and frozen. Having frozen Rhubarb Crumbles oven-ready, is a quick and simple way to provide spring-time treat at other times of the year. Serve warm Rhubarb Crumble with a scoop of vanilla ice cream to make a delightful dessert. Rhubarb leaves are not to be eaten because they contain high levels of oxalic acid which is toxic to humans in large doses. 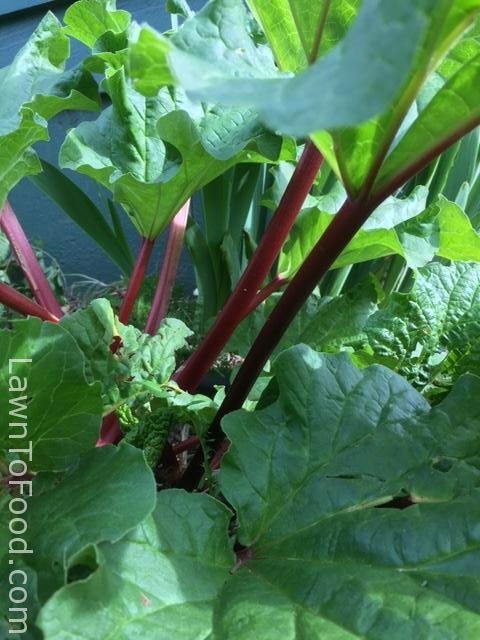 Use Rhubarb leaves to mulch around plants, compost it or use them to make household cleaning solutions. Also, you might want to try using Rhubarb leaves to create a bird bath.